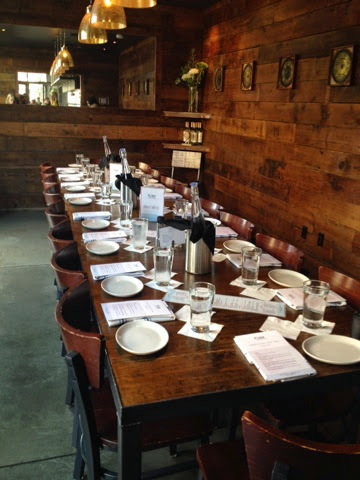 Table set and ready for bloggers. One of our place settings. Oysters on the half shell--$1 during happy hour. During our event, we were able to sample items from the Happy Hour menu. The food was beyond amazing. 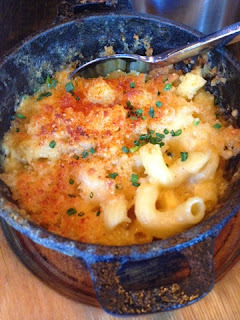 And I must admit that the Baked Mac & Cheese was the best Mac and Cheese I've ever had. Here's the description: cast iron baked, cheddar, bechamel, cavatappi pasta, parmesan breadcrumbs, paprika, chives. It's one not to miss! Eco-Friendly Water: We offer Vivreau environmentally-friendly water at Plank as part of our sustainability program. It's filtered, purified and chilled, bottled on-site, and you have your choice of still or sparkling. The service is just $2 per table with unlimited refills. Tap Wines: Another part of our sustainability efforts is our eco-friendly tap wine system. Choose from 8 wines, stored in reusable steel kegs, eliminating waste from cardboard and glass packaging. Our kegs are vacuum-sealed and temperature-controlled to ensure every glass is fresh and served at its optimum temperature. 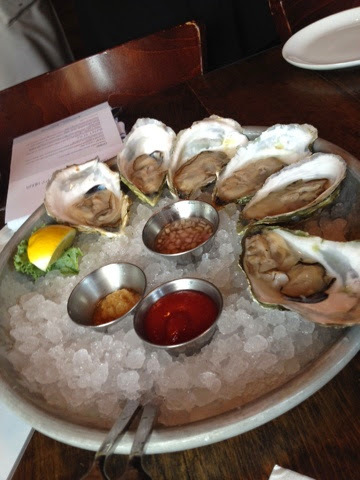 Happy Hour: Enjoy fresh shucked oysters on the half shell for just $1 during Happy Hour! No minimum, no maximum. Slurp to your heart's desire! You'll find soups, sandwiches and several hot starters with favorites like Braised Beef Flatbread, Scottish Salmon Crostini, Poutine and Potato Crusted Calamari. Pair these tasty dishes with $6 spiked lemonades, $4 select cocktails, $3 house wines and more. Our Happy Hour is offered Monday through Saturday 3-6:30pm and Sunday noon-8pm. For dessert, I got the Chocolate Torte. It had chocolate ganache, coffee flavored ice cream and raspberries with the torte. 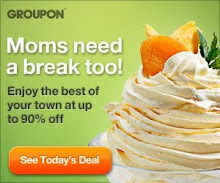 I normally don't like coffee ice cream, but this really worked to balance out the incredibly sweet torte. 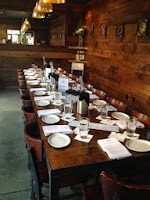 What: Join us on Twitter to learn more about Plank Seafood Provisions and answer fun questions to randomly win prizes! The more you tweet with the hashtag #PlankSeafood during the party the more chances you have to win. You must RSVP at this website and be present during the Twitter Party to win. RSVP: RSVP HERE in order to be entered to win. 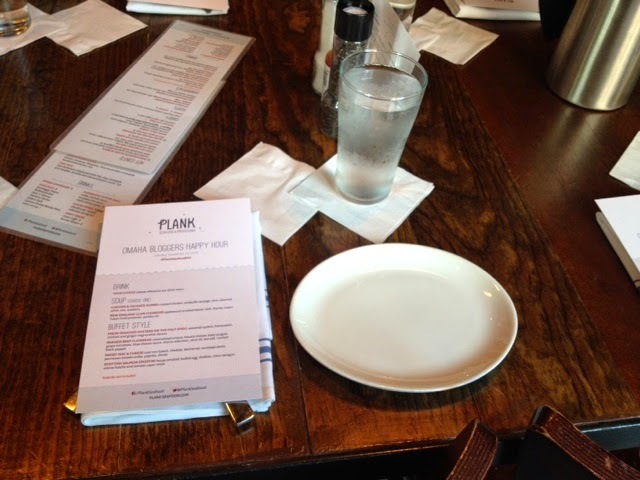 If you haven't been to Plank Seafood Provisions yet, and want a sneak peek at the Happy Hour Menu, checkout #PlankSeafoodHH on Twitter and Instagram for some yumminess! Now go on, RSVP below and mark your calendar for the Plank Seafood Provisions Twitter Party on September 29th! Twitter Party Rules: Winner must RSVP and be present to win. Winner must be able to go to Plank Seafood Provisions in Omaha, Nebraska to redeem Gift Card. Winners will be drawn randomly from RSVP list and announced during the Twitter Party if they are present. Any information obtained is solely used for the Twitter Party and Prizes. Want to hear something funny? When I left Plank Seafood Provisions Monday night, I had to call my husband and rave about everything. When I say everything, I mean even the water! It is noticeably smooth and tastes good, not that water has a taste, so it's hard to describe, but seriously, the water really is rave about it worthy! 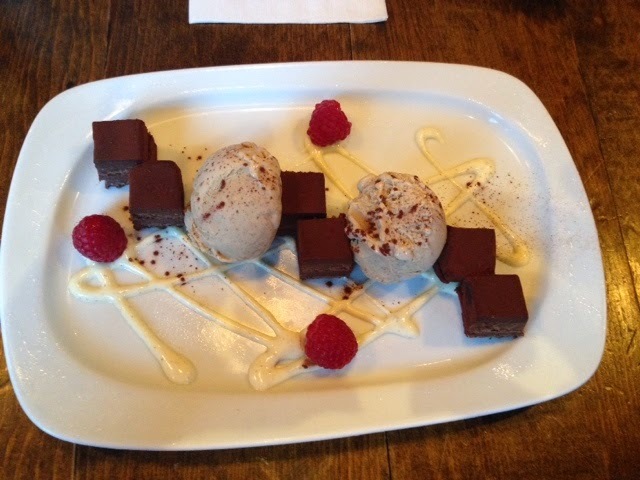 I loved the dessert! Thanks so much for sharing! It was great getting to see you!